Noun Project for Microsoft PowerPoint & Word. 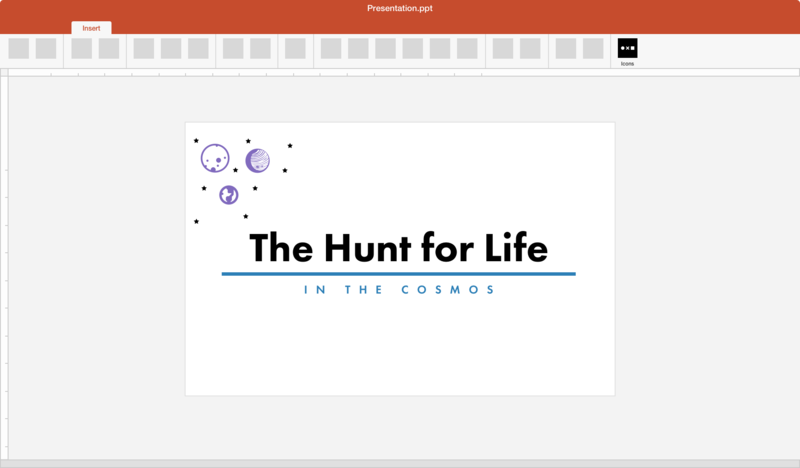 No need to download—just insert icons right from your task pane, perfect for creating your next presentation or doc. Change the icon color to get the perfect hue & specify size to fit your needs - all from your task pane. Add-in is free to use with access to 100 of our most frequently used icons. Unlock over a million more anytime by upgrading to NounPro. You can use the add-in with Microsoft PowerPoint and Word. Microsoft Office 365 for PC, Mac, or Web is required. Absolutely! The add-in is free to use for anyone (no account required) with access to 100 of our most frequently used icons. Unlock over a million more anytime for just $39.99 per year. Easily switch icons from black to white or choose any color of the rainbow. The add-in will automatically save your color choice for next time.